The Toyota Avalon is a stylish sedan that builds on all the best that Toyota has to offer: quality construction, beautiful design, reliable performance and exceptional value. The full-size sedan offers a comfortable ride and is suitable for families or business professionals. The 2016 Toyota Avalon will continue to build on its foundation of excellence while also introducing some changes that improve its performance and style. If you can’t wait for the new Avalon or don’t have the budget for a new car, you can check Toyota of NH dealers for great deals on quality previously-owned Avalons. The Avalon is an attractive sedan, so major design updates weren’t necessary. The 2016 Toyota Avalon gets minor design tweaks that enhance the profile without alienating fans of the sedan. The most notable change is the wider lower grille, which was already oversized on the last model. Some have liked the downturned grille to a frown, but combined with the upswept head lights and upper grille, the front end has a look that’s more sophisticated than austere. This is a grown-up car with a grown-up look. The fog lamps have been removed on the new Avalon and replaced by vertical turn signals. LED running lights have been placed inside the head lights. At the rear end, the 2016 Avalon has new tail lights and chrome accents, creating a streamlined look. While the exterior might be what turns heads on the road, the interior is what is enticing to the drivers themselves. 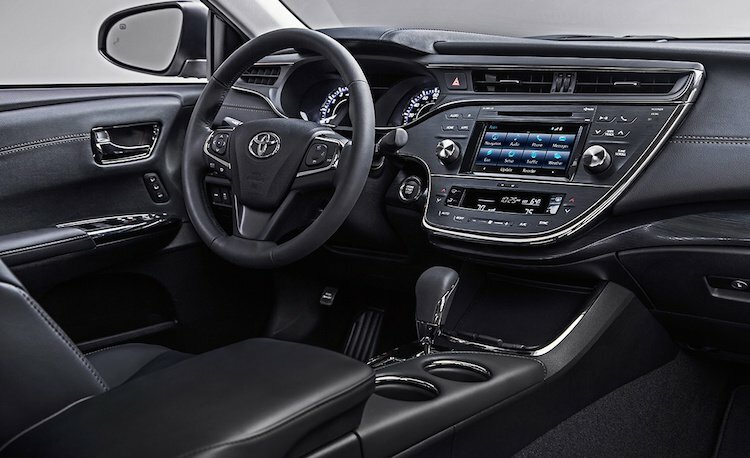 The 2016 Avalon delivers with a gorgeous and comfortable interior. The monochromatic design creates a strong visual impact, and contrast stitching adds interesting accents. Premium materials are used for not only a beautiful look but also a soft touch. The large dash console puts all the features at the touch of your fingertips in an intuitive layout. The 7-inch touch screen features infotainment controls for the audio system, Bluetooth calling, and much more, depending on the trim level. The cabin hasn’t lost any space with this model, unlike some previous redesigns. There is still plenty of legroom for all passengers, and seating is plush and comfortable with plenty of adjustments available to get just the right fit. The 2016 Toyota Avalon delivers a stronger performance than what you might expect from a mild-mannered sedan. The power train has not changed on the Avalon, but some other updates have been introduced to improve the performance. The 2016 Avalon comes with a 3.5-liter V6 engine that puts out 368 horsepower and is paired with a six-speed automatic transmission. The Avalon now features two new suspension options for either improved comfort or enhanced performance. The XLE through Limited trim levels have the suspension system that has been designed for a more comfortable ride, while the Touring trim features a suspension designed for more responsive handling. The Touring model also gets larger, 18-inch wheels. For the eco-minded, the Avalon also offers a hybrid option, which includes a 2.5-liter four-cylinder engine that puts out 156 horse power. It has a two-speed continuously variable transmission. What you lose in power, you make up for in fuel efficiency and in knowing that you are doing your own small part to protect the environment by reducing emissions and consumption of natural resources. Last year’s Avalon came with four trim levels, but the 2016 model is available in five, providing more options for buyers to find just what they need. The trim levels are the XLE, XLE Plus (new for 2016), XLE Premium, Touring, and Limited. The hybrid power train is available on the XLE Plus, XLE Premium, and Limited trims. All trim levels are four-door models with seating for five. Little is known about the XLE Plus trim level and what it will add to the features offered on the base model. If history is any indicator, there will be a few new features, but you can expect to find a lot of the same offerings as on the base model. The XLE Premium comes with features such as a navigation system, app suite, Entune premium audio system, and wireless charging for personal devices like smart phones and tablets. Primarily, the updates here are for tech lovers, but no design updates are featured. The Touring trim level has a slightly updated fascia, dark-gray wheels, daytime running lights, and LED head lights. The biggest changes on the Touring level are in the suspension package and the performance upgrades. The Limited trim level is designed for those who want a more luxurious look and feel for their sedan. This trim level has wheels trimmed in super chrome, perforated leather upholstery, three-zone climate control, heated and ventilated front seats, heated rear seats, adaptive cruise control, lane-departure warning, and forward-collision warning. The Limited trim level also comes with a premium audio system with 785 watts. No information has yet been released about optional packages for the Avalon. As seems to be standard with these teasers about new models, the official pricing has not yet been released. The current Avalon starts at $31,590, so buyers can expect a similar price tag for the 2016 model, if not slightly more. The 2016 Avalon will be making its way to Toyota dealers across the country in the fall, but no specific date has been announced. Of course, if you don’t want to wait a couple of months to check out the new Avalon, you can visit used Toyota NH dealers now to test drive previous models. You might also find a few 2015 models still available at new dealerships. Rochester Toyota sells a large selection of new and previously owned Toyotas, and we have Avalons in stock for you to test drive. Visit us today to learn more about this sedan and to be notified when the 2016 model becomes available.